Recommended dosage is 4.0 mg/kg (1.8 mg/lb) of horses bodyweight per day. Use one (1) full syringe once daily for 28 consecutive days. 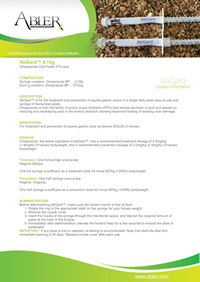 Recommended dosage is 2.0 mg/kg (0.9 mg/lb) of horses bodyweight per day. Use one half (1/2) syringe once daily ongoing as required. Our Dosage Calculator is available to assist you. 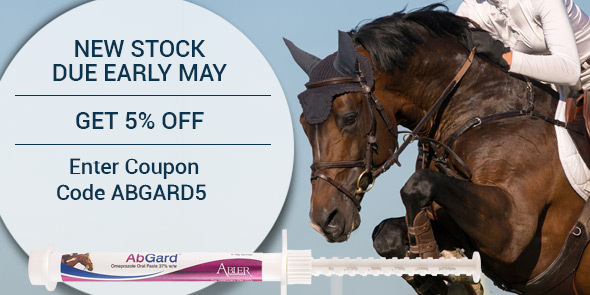 Before administering AbGard™, make sure the horse's mouth is free of food. Rotate the ring to the appropriate mark on the syringe for your horses weight. Insert the nozzle of the syringe through the interdental space, and deposit the required amount of paste at the back of the tongue. Immediately after administration, elevate the horse's head for a few seconds to ensure the dose is swallowed. IMPORTANT: If any dose is lost or rejected, re-dosing is recommended. Take note that shelf life after first immediate opening is 28 days. Replace nozzle cover after each use.